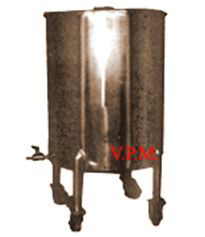 The tanks are fabricated from S.S. 304/316 quality. The tanks are polished and buffed to get mirror finish from inside and outside. The tanks are supplied with lid, outlet, and 4 Nos. legs fitted with fiber castor wheels.